GR, have you not a bicyle? The Evening Echo is running a 3 Part series interviewing people directly and indirectly involved in the tragedy. Tonight it spoke to a son of one of the victims, who celebrated his fourth birthday the day before his father was killed in the explosion. There is also an amazing photo of the centre section of the Tanker, as it was being towed away to be sunk at sea. interesting article it was the bow section that was sunk at sea that section was scrapped in spain and a lot of it ended up in irish steel. warship deirdre had the task of escorting it out to sea(bow section) and it fired a lot of 40 mm bofors at it to send it to its final place of rest unfortunately cameras were not common articles with us as they are now and we would have got some interesting photographs the tug in the echo picture is the smit tak helping out the lifting platform taklift a great bunch of lads and we got on great with them during the year long operation while they were there. Photo tonight of the Funeral that was held for two of the victims. The French Navy carried one coffin, to signify the french killed in the tragedy, while the Irish NS carried the other, to represent the irish men killed in this disaster. I believe some IMO members may have been involved in this funeral party. Last edited by Goldie fish; 9th January 2009 at 01:24.
the personell visible are pat harrison. derek oakes. jimmy casey, the officer is hugh tully.. I think it is fair to say that a disaster like this has not happened since. All tankers are fitted with inert gas systems, and enclosed lifeboats are fitted to both Tankers and jettys, thus preventing the main factors that led to the Deaths in Bantry. I don't think there was a similar disaster after Betelgeuse, in spite of the large amount of Crude that has been carried around the world in the last 30 years . Valuable lessons were learnt. PRESIDENT Mary McAleese couldn’t make yesterday’s commemoration, but she sent a letter to the victims’ families assuring them her thoughts and prayers were with them. In the letter, which was read out at the Mass, Mrs McAleese said it was fitting on the 30th anniversary to pay tribute to all those who lost their lives. 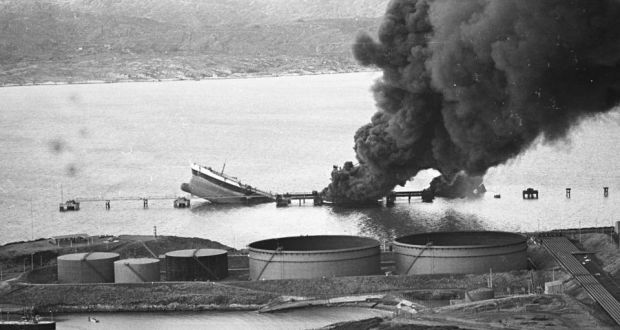 But she said she hoped some good had come from their sacrifice because, as a result of the inquiry, safety procedures had increased significantly on tankers, which should help safeguard crews today. Anchored in the harbour yesterday were two warships. The French sent over the Cassiopee, a minesweeper, and the LÉ Emer represented the Irish Naval Service. Both crews formed guards of honour at various ceremonies during the day. Also in attendance was the navy’s commander, Flag Officer Commodore Frank Lynch. It evoked several memories for him as he was captain of the LÉ Fola, the first naval vessel to respond after the disaster struck. French ambassador, His Excellency Yvon Roe D’Albert, made his first trip to Bantry for the commemoration, along with his wife Marie-Claud. He said the families of the French victims would never forget how welcome they had been made to feel by the people of Bantry. Peter Power, the junior minister for foreign affairs, represented the Government at the ceremonies and said all those involved in perpetuating the memory of the Betelgeuse dead deserved to be thanked for their efforts. Many people’s hearts went out to Liam Shanahan as he laid one of several wreaths at the memorial. He was born the very night that his father died in the disaster. Tears welled in the eyes of mourners during that ceremony, which got under way after lone piper Donal Cronin played a lament. Bishop John Buckley gave a blessing at the memorial before the names of each of the dead were read out. That was followed by a minute’s silence as a mark of respect. A WOMAN who lost both her parents when the oil tanker Betelgeuse blew up in Bantry harbour spoke publicly for the first time about her family’s grief yesterday — exactly 30 years after Ireland’s biggest peacetime maritime disaster. Marylene Lasalle was 22-years-old and five months pregnant when she heard the tragic news at her home in France. Her father, Louis, 54, had been a baker on the French oil tanker that exploded at the Whiddy Island terminal in the early hours of January 8, 1979. Her mother, Marcelle, 49, wasn’t a member of the crew and “had only gone along for the trip”. The Frenchwoman said her family had been devastated by the tragedy which claimed the lives of all onboard. A total of 42 French people died in the disaster. Seven locals also lost their lives and a Dutch diver died during the salvage operation. She described the commemoration as “a superb ceremony” and added that the welcome she’d received from local people was “fantastic”. Her sister was also supposed to attend yesterday’s commemoration, but she lives near Toulouse and heavy snow in that region prevented her from travelling. Many more relatives of French victims made the trip, including one family which travelled all the way from the West Indies. Ketty Cassand was 13 when her father, Charles, was killed on the 120,000-ton supertanker. “I was 13 and I had two brothers who were 14 and 11 at the time. We were preparing to go to school that morning when we heard the news on the radio. I thought the worst,” Ms Cassand said. Following the tragedy the family left France and moved to the West Indies. Ketty, her two brothers and mother, Parise, arrived in Bantry on Wednesday. “This helps us overcome the sadness. We know we are not alone. We have made many friends with people from Bantry who also lost relatives,” Ms Cassand said. Michael Kingston was one of the locals they were talking about. He celebrated his fourth birthday the day before his father, Tim, died in the inferno which resulted from the explosion on the tanker. Yesterday he acted as MC throughout the various ceremonies. First he welcomed hundreds of people to the commemorative mass at St Finbarr’s Church and then officiated when several wreaths were laid at the Betelgeuse memorial in the nearby cemetery. He was also on hand at an emotional moment when families of the victims went out in a ferry to Whiddy Island to place flowers on the sea in memory of their loved ones. He said it was not only important to remember those who had died and their families, but also those who had helped in the aftermath of the disaster. Bantry parish priest Fr Robert Brophy told mourners that he could only imagine the horror which gripped the town at the time. “The Whiddy disaster has left an indelible mark on the minds of every Bantry person. This horrendous explosion shattered lives and the livelihoods of many in the community,” Fr Brophy said. He told the French visitors the commemoration was a time for prayer, healing and hope and assured them the people of Bantry felt their pain. Fascinating documentary about the salvage of the ship. Well worth a watch. fantastic...and all manged with only two hard hats , and no high vis or life jackets, bouyancy suits or anything even remotely related to health and safety. Great show really enjoyed it thanks. I couldn't help thinking while watching it of the diver who died during the salvage. Thanks for posting that Goldie, it was fantastic. The damage to the accommodation block aft was quite disturbing. It shows the intense forces involved in the explosion and horrendous fire that claimed the lives of its crew and workers at the jetty. People in Bantry still remember that night, and the remainder of the jetty acts as a constant reminder. When one remembers that there was no such thing as freefall lifeboats till after this event, no inert gas used during unloading, no double bottoms, no standby FF tug. All brought in after, some as result of this disaster. Yep the damage to the aft deck was catastrophic - the footage of the engine room was particularly eerie. Another video on youtube has a comment from a member of another tanker which was due to unload at the jetty after Betelguese and mentions that they heard the crew reporting the fire... it's the stuff of nightmares. Thanks for sharing the video, Goldie. Thanks for that Goldie. fascinating documentry. Another sad anniversary, passed today. Now 35 years. The scars remain, both physical, and psychological. Last edited by Goldie fish; 8th January 2014 at 20:45. A survivor of the Whiddy Island oil terminal disaster in Bantry Bay, west Cork, yesterday spoke of the impact the tragedy continues to have on him as he marked the 35th anniversary of the calamity which claimed the lives of 50 people. Brian McGee (68) was on duty as a pumpman at the Gulf Oil terminal on the island when in the early hours of January 8th, 1979, a fire broke out on French tanker Betelgeuse, berthed at the jetty, which triggered the inferno. “I died that night – the Brian McGee that went to work that night never returned and I’m not the same person,” said Mr McGee who along with his colleague, John Downey, fought to keep the burning wreckage away from 12 80,0000 tonne crude oil tanks on the island. Mr McGee, who is writing a memoir of his experiences that night on Whiddy Island, had hoped to attend yesterday’s anniversary Mass in Bantry for the friends he lost but he said post-traumatic stress leaves him vulnerable to illness at this time of year. – the post-traumatic stress just wears me down. I would like to have gone because those who died were my friends – I had worked at the terminal for 10 years and I knew them all well,” he said. Among those who died were locals Charlie Brennan, Tim Kingston, Denis O’Leary, Neilly O’Shea, Jimmy O’Sullivan and David Warner. Englishman Mike Harris also perished and Dutch diving supervisor Jaap Pols died some days later during the salvage operation. Some 42 French members of the Betelgeuse crew also died in the tragedy and all were remembered at yesterday’s anniversary Mass at St Finbarr’s Church in Bantry and at a wreath laying ceremony at the Betelgeuse monument at the Abbey cemetery overlooking the bay. Mayor of Bantry Cllr Aidan McCarthy was among those who attended and he said it was important for those bereaved that it should be remembered. As we approach the 40th anniversary of this tragedy I notice RTE earlier tonight showed an episode of "Scannail" regarding the events of the disaster. It makes for interesting reading, and clearly shows the attempts made by the Large oil companies to blame anyone but themselves for their mistakes, with no regard how this would impact on the individuals. They first tried to claim the fire started ashore, but there was no evidence of this, as bodies of some the ships crew were found on the jetty, not someplace they would have been gathering had it been on fire. They then tried to claim Gardai, and every eyewitness in Bantry were lying about the time when the first explosions were heard, but this was discounted by the tribunal. Explosions were heard by people at the other side of the bay by people who could verify exactly what time it was, or wasn't. The Dispatcher on the terminal was not in the control room when he was supposed to be and a huge effort was made to cover this up. 40 years on it is still unclear where he was. The poor man has had to live with this. The ship was an actual rust bucket, some of the hull plating had diminished to thickness not much thicker than a coin, when it should have been about an inch thick. It was heading for the breakers when it had unloaded, but fate meant it did not unload where it was supposed to, and instead probably suffered further strain when making the journey accross the Bay of Biscay in January. Potential buyers had visited the day before the explosion and took photos detailing its poor condition. She wasn't the largest tanker to visit Whiddy, While a VLCC with an LOA of 281.6m and a GRT of 61766T she would be considered small compared to the Largest ship to visit Bantry Bay, amid huge publicity, Gulf Oil's Universe Ireland, a ULCC at 345.3m LOA and GRT of 149609T. Indeed the largest tanker currently in service is The FSO TI Europe and its sister ships (Tanker converted to floating storage) vessel at 380m LOA and GRT of 234006T. The book "The Ninth Ship" deals with the Irish NS experience of the recovery operation, and the realisation that the NS were not in the game at all when it came to diving in anything other than ideal conditions. "Swimming in Guinness" was how one described it. It also mentions how the crude oil damaged the apparatus of one naval diver to the extent that it disintegrated while he was operating it. I pass the area frequently during the course of my work and have taken to telling my younger colleagues about the history of the jetty, what happened in 1979 and what the SPM is. While the terminal is again fully operational using the SPM, and operated by Zenith Energy. The Jetty remains a constant reminder of what happened. A reminder of what can go wrong when big business buys off governments to avoid safety regulations. Certainly diving to 100feet plus made demands on safety and restricted bottom times ( 14minutes ) for what were essentially Ships Divers. It was formative in that as a result of the Whiddy experience equipment types and quality improved. It would be interesting to evaluate the Insurance outcomes on the destruction of the pier and why it was not expended on it's reconstruction. Overall the ducking and diving ( pardon the unintended pun) of the law and litigants was shameful leading to a festering future for surviving relatives. Well done to Danny, George, Gerry and others. Possibly down to the fact there are still remains, forever amongst the twisted burnt carcass of the jetty. Of the 50 killed on the night I believe only 28 bodies were recovered. Many of those had died from drowning, not fire. The catastrophic explosion after the initial fire caused houses to shake on the other side of the bay, we can only imagine the impact it had on the poor souls on the ship at the time.